My mom recently sent me a couple of neat scarves (and one for hubby). I got this houndstooth number and a leopard one; hubby got a Blackwatch tartan scarf (but I might wear it too). I wore my scarf with a bright pink sweater I picked up from a clothing exchange. Halfway through my photo shoot, I heard a strange rat-a-tat-tat. I looked up and across the street, hammering on a cell tower, was a woodpecker! What a beauty. I believe this guy (or gal) is a pileated woodpecker. I love eyeing wildlife–especially in the city. It’s amazing how many neat animals drop by. From rabbits to crows, they’re all so fun to watch. I’ve even seen raccoons. Hubby’s even seen a full-grown buck and two coyotes (we live near a greenbelt). I admire all the species who work hard to eke out an existence and raise their families. 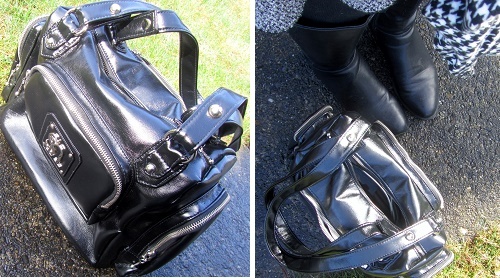 After my nature experience, I picked up my purse–an amazing Susan Nicole number that I won in a raffle at the Walk for Farm Animals last fall–and headed off to work. I’m joiningtwo linkups today: Lena B. Actually for Passion for Fashion and Style Elixir for Friday Fab Favorites. See what all the others are wearing! Ha ha! Robins are cool too. And when you see them, you know spring is here! They’re a good sign. I agree that you should get some houndstooth! WOW!! 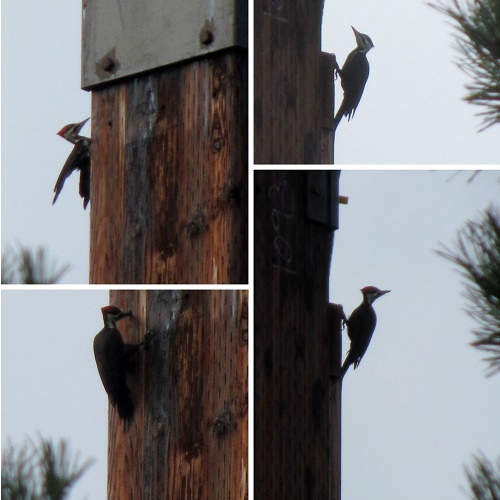 Great photos of the woodpecker! We have the smaller flickers coming to our trees in the back yard, I can hear them pecking away. 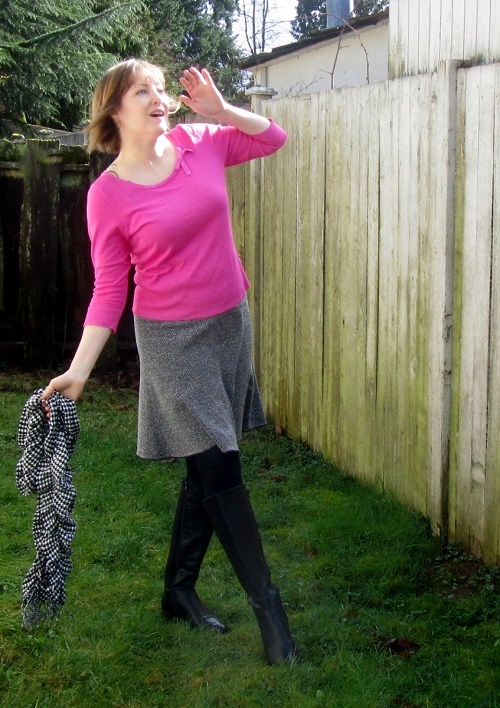 Love your outfit, you’ve inspired me, I have a pink thrifted top I got recently, a gray skirt and the same scarf. I’m wearing my new houndstooth skater skirt in today’s post. Oh, I like flickers too. We have them as well. I’m glad I inspired you to try pink and gray. THANK YOU VERY MUCH FOR SHARING YOUR PINK STYLE WITH US. This is your “promotion manager” (AKA Mom). I entered this post for you on Share-in-Style. The theme is PINK! I also linked my new pink post with photos from this weekend and immediately got a nice comment from Mis Papelicos. I always appreciate your help. Thanks for beating me to it! You know I enjoy entering link-ups and “meeting” other bloggers. Pink with houndstooth is one of my favourite ever combinations. I love this, so beautiful. Thank you so much! I’m glad you found my blog through the link-up! What a coincidence! Daniel told me yesterday that he saw a pileated woodpecker in his backyard recently. I have a Blackwatch tartan scarf too same as your hubby (we’ll make a Scotsman out of him yet). Wow! they’re so neat. Glad Daniel got to see one as well. Today, I saw a bald eagle flying overhead and on Saturday, we saw a coyote! Blackwatch is a great tartan and is a good gateway pattern for becoming Scottish!